Over the last two years, President Donald Trump has made every effort to rescue America’s ailing coal industry, opening public lands to mining, weakening limits on pollution and potentially eliminating protections for miners. It hasn’t worked. Utilities continue to shutter coal-fired power plants, and mining firms continue to shed workers. Read the entire article at GreenBiz. Desperate to throw a lifeline to the coal sector, the administration has considered directly subsidizing coal in the name of national security. Coal-fired power plants, they say, are essential to grid security, as they are uniquely able to withstand a cyber attack or a natural disaster and continue to generate power on demand. But as experts have pointed out, nothing could be further from the truth. As it happens, locally sourced renewable power, not coal, promises the most resilience in the face of a catastrophe. That’s why the military has embraced clean energy — for the sake of national security. A new report from the Association of Defense Communities and Converge Strategies details how military bases are turning to renewables to guard against blackouts in the wake of floods, storms or cyber attack. “The [Department of Defense] is deploying these projects because of increasing threats to the U.S. electric grid,” said Wilson Rickerson, a principal at Converge Strategies and a co-author of the report. In many ways, the U.S. military stands at the vanguard of the transition to clean energy. 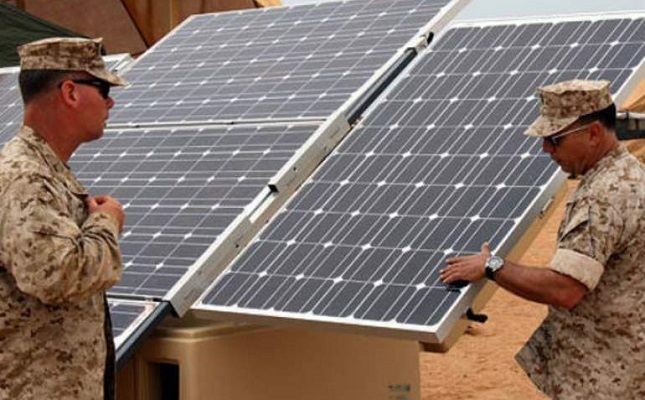 Troops in the field have deployed solar power and batteries to reduce their reliance on oil and gas, saving money and helping to guard against attack. Fuel convoys are frequent targets for roadside bombs, and diesel generators can be a liability when under siege. Firsthand experience with clean energy leads many veterans to pursue careers in the industry after they leave the service. Kevin Johnson, an Army veteran who runs GlidePath Federal Solutions, a developer of resilient energy systems for the Department of Defense, said that when men and women work on a base powered by solar, “they’re going to see, right there on the base, that solar is viable, that the military finds value from energy security and energy resiliency.” The fact that so many veterans are then drawn to jobs in clean energy is testament to this fact. Far from making the grid more vulnerable to disasters and attacks, wind, solar and battery storage are making the grid more resilient. The military is helping to prove that.